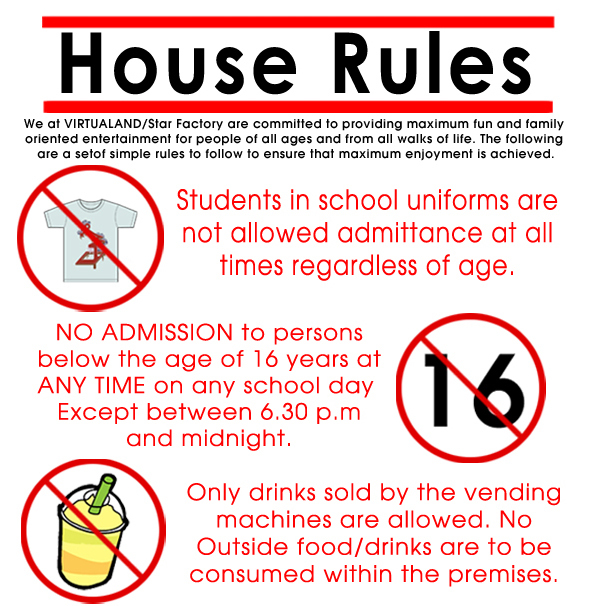 Virtualand or Star Factory's staff reserves the rights to do a check on any suspicious under-age customers playing at the prohibited timing. Please RESPECT the rights of others and their rights to enjoy the game. In our LAN cafes, please do not use/ view any materials that are sexually, explicit, harmful, abusive, obscene, hateful, racially or ethnically offensive. STRICTLY NO gambling, fighting, consuming of alcohol or betting within premises. Offenders will be referred to the police. Please do not vandalise or steal within or directly outside the premises. Offenders will be required to pay for the damages and/ or will be referred to the police. Please take care of your own belongings. Virtualand and Star Factory will not be responsible for any loss/ damage belongings!